Chris Jansen will be a key player for North in 2019. After a year of growth, North Melbourne’s VFL side looks forward to its second season as a standalone side in the state competition. A slew of new faces have joined the existing VFL-listed players at Arden Street, with plans to impact in September after narrowly missing out on a finals berth in 2018. With the season proper right around the corner, North Media previews the 2019 VFL season. The former Hawk switches to Arden Street, joining North as both a development coach, and VFL player. The 28-year-old, who lifted a VFL premiership with Box Hill in 2018, bolsters the Roos’ young list, bringing 11 years of AFL experience to North’s VFL side. The accomplished midfielder excelled in his first year, thriving in a deeper role to claim the inaugural John Law Medal as the club’s best and fairest VFL player in 2018. Rippon is expected to hit a century of VFL games this season, currently listed at 97. After finishing second in the club best and fairest, North’s inaugural co-captain is expecting to reach higher heights in his second season at the club. Often flanked by contested bull Nash Holmes, Jansen has developed a reputation as one of the best tacklers wearing the royal blue and white stripes. The speedy defender has signed with the club’s VFL team after being delisted by the AFL side at the end of 2018. Providing line-breaking run and experience in the AFL system, Morgan will boost North’s youthful defensive six. The former Sydney utility, who switched to North after five seasons with the Swans, is praised for his ability to win the footy in traffic. Robinson featured nine times at AFL level in 2018, averaging 12.2 disposals per game, holding an impressive average of 37 disposals in the NEAFL. 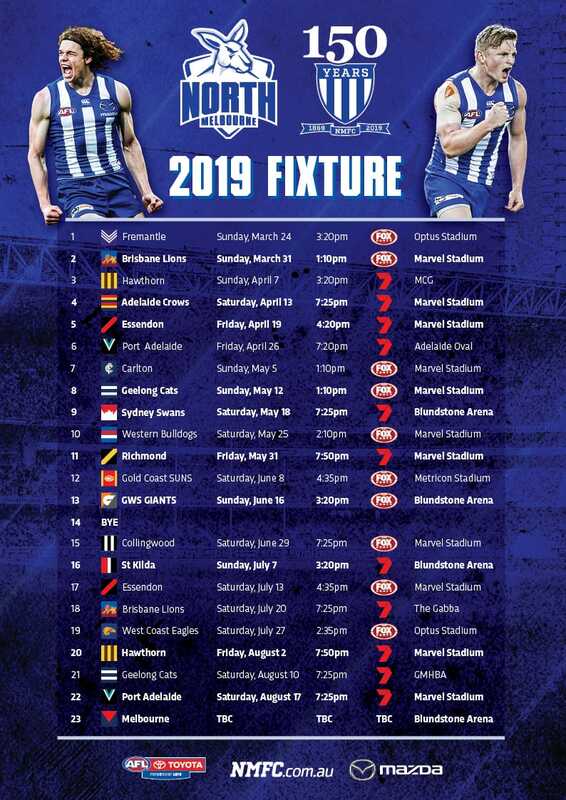 North will play twice under lights in 2019, starting with its season-opener against Werribee at Avalon Airport Oval, and a further clash with the Bulldogs at VU Whitten Oval. 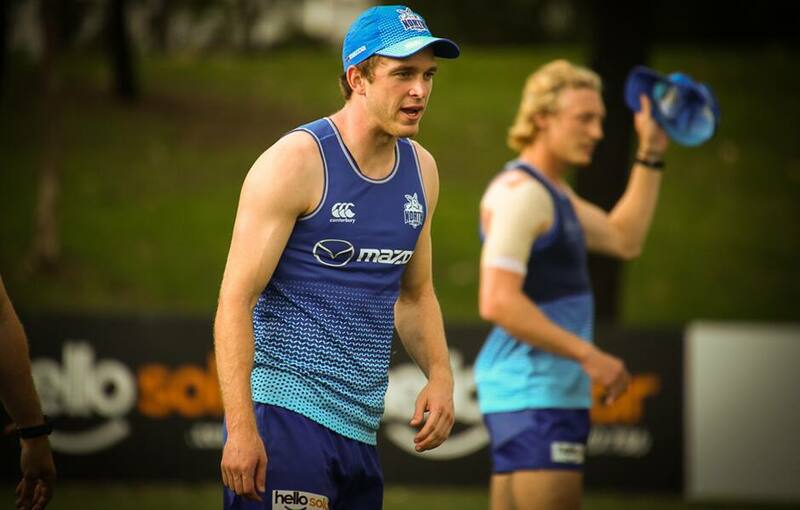 The Roos will partake in three double-headers alongside the club’s AFL side, with two taking place on the big stage at Marvel Stadium and another on the road at GMHBA Stadium. The lone televised game of the season will be against Sandringham at Arden Street. The Roos' VFL outfit will play home games at Arden Street throughout 2019. “It’s enormous for us on a number of fronts,” coach David Loader told North Media. “Logistically, it’s going to be very easy to be here. To have all the gear we want, and to have access to the resources we have on a daily basis. “But it’s way more than just that. For the broader community and for the North Melbourne people, to have a North Melbourne team run out at Arden Street is going to be important. “It just diversifies everything, the whole place has a different look,” Loaded said. “It’s a challenge while the redevelopment is going because there’s so many people around. Across the board, you couldn’t be more impressed. “Certainly, with the head of the football department, right all the way through. Overall, with all levels of football and with the four teams at the club. For behind-the-scenes content and matchday updates, you can follow all the action on social media across our Twitter and Instagram handle, @NorthVFL. Stay up-to-date by heading to our Facebook page for the latest news, views and videos. Entry to home games is free for North members upon presentation of their membership card.